Skyscraper-speckled Lower Manhattan, where the city of New York was born, is in the midst of a rebirth of mammoth proportions some 400 years later. One of the fastest-growing neighborhoods in Manhattan, the historic area falls smack dab between the Hudson and East Rivers, south of Chambers Street, on the island's southern tip, encompassing the Financial District, Battery Park City, and parts of the Civic Center. Here, a maze of haphazard streets (some still cobblestoned) come steeped in centuries of history, where the original Dutch "New Amsterdam" settlement was established in 1626, turning into Britain's "New York" colony in 1664, before evolving into a bustling modern mega-center for business, finance, and government—layers of development that have produced the intriguing contrast of old and new that is represented here today. After the emotional and economic devastation to the quarter in the wake of the September 11th attacks, a large investment in money, time, and energy has served to successfully revitalize the area via a slate of new developments. 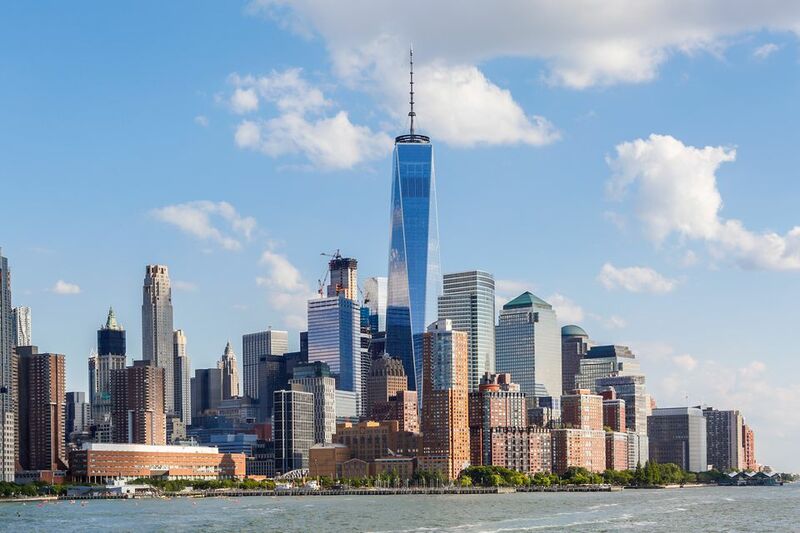 Lower Manhattan has now firmly emerged as a hub for loads of newcomer residents, businesses, and visitors who are rightly looking at the area in a new light. Long popular as the gateway to iconic NYC attractions like Wall Street, the Brooklyn Bridge, or the Statue of Liberty, Lower Manhattan is now riddled with loads of new restaurants, bars, shops, and hotels, too, along with recently debuted attractions like the observation deck atop the gleaming One World Trade Center, and its adjacent sleek new Oculus transportation hub. Only have a couple of days to explore this fascinating corner of Manhattan? Then make it count by incorporating these picks for the new and tried-and-true, on just where to sleep, eat, drink, shop, and play. 2 PM: Check in to your hotel. For a splurge, consider a stay at the fall 2016-debuted Four Seasons Hotel New York Downtown (27 Barclay St.), tucked within a building designed by architect Robert A.M. Stern and set a stone's throw from One World Trade Center. The posh hotel brand's second NYC outpost, 189 chic rooms come outfitted with marble bathrooms, deep-soaking tubs, and lots of high-tech trimmings. There's also an on-site spa, fitness center, and CUT by Wolfgang Puck, the celebrity chef's first Manhattan eatery. For more affordable digs, look to the nearby LEED Gold-certified World Center Hotel (144 Washington St.), with 169 comfortable guestrooms featuring floor-to-ceiling windows, iPod docking stations, and value-add amenities like complimentary Wi-Fi and a guest fitness center. 3 PM: Pay tribute to the 9/11 tragedy and see how the World Trade Center site has risen from its ashes in true phoenix fashion. Start with the evocative and serene 9/11 Memorial (180 Greenwich St.) twin side-by-side sunken memorial pools that sit on the imprints of the two fallen World Trade Center towers. The gaping, seemingly bottomless pools are fed by a constant cascade of 30-foot waterfalls. Inscribed in bronze on the memorial's walls are the names of every person who died in the terrorist attacks on September 11, 2001, along with the victims of the WTC bombing in '93. 4 PM: Adjacent to the memorial is the 2014-debuted, 110,000-square-foot 9/11 Memorial Museum, which documents and displays the tragic history and significance surrounding the events of September 11th via a collection of artifacts, archives, and multimedia displays (including oral histories). The subterranean museum unfolds at the foundation of the former WTC site and is clustered in two main exhibitions. These include the "Memorial Exhibition," depicting the victims of the attacks via artifacts, memorabilia, and personal stories. The "Historical Exhibition" strives to recount the events (with artifacts, images, audio and visual recordings, and first-person testimonials) surrounding the three American sites struck during 9/11, and to explore both the lead-up to and the aftermath of the incident. Give yourself about two hours for a visit; skip the lines with advance timed tickets for museum entrance. 6 PM: Now the tallest building in the U.S, the 104-story, $3.9 billion, 2013-debuted One World Trade Center—home to high-profile tenants like Condé Nast and Moody's Investors Services—soars some 1,776-feet into the sky. Visitors can swiftly ascend the top of it via high-speed, high-tech "sky pod" elevators to take in first-rate, only-in-NYC vistas from the One World Observatory, set some 1,250 feet above street level. The observatory spans the 100th, 101st, and 102nd floors, with several viewing platforms and exhibits, as well as spots to dine or grab a drink; book timed tickets in advance online (One World Trade Center). 7:30 PM: Before setting off for dinner, sneak a quick peek at the 2016-debuted World Trade Center commuter hub (home to the Westfield shopping center), dubbed the "Oculus"– the sleek, steel-ribbed, $4 billion project was designed by acclaimed architect Santiago Calatrava and with its soaring "bird-in-flight" design, is truly a sight to behold. 8 PM: Grab a bite and a nightcap at the August 2016-debuted, Eataly NYC Downtown, the outfit's second NYC outpost (with a flagship store in the Flatiron district). This upscale Italian market emporium is open till 11pm daily, doling out cuisine via five themed in-house eateries, six takeaway counters, and two bars—one for coffee and one for wine (4 World Trade Center, 3rd Fl.). 9 AM: Rise and shine with a walk over to the modern office, shopping, and dining complex at Brookfield Place (formerly the World Financial Center), fronting the Hudson River just west of One World Trade Center. Home to a slate of high-end retailers, the likes of Burberry, Gucci, and Saks Fifth Avenue have set up shop here (230 Vesey St.). There are numerous worthwhile eateries worth seeking out (like the Blue Ribbon Sushi Bar), but for breakfast, check out Le District, a French-inspired food hall serving crepes, pastries, coffee, and more, or Hudson Eats, a fancy food court with breakfast-friendly options like Black Seed Bagel. 10 AM: Continue with a stroll along the waterfront on the Battery Park City Esplanade , boasting great views of the Hudson River and out onto New York Harbor (and the Statue of Liberty), while skirting the entire length of the residential, family-friendly community of Battery Park City. 10:30 AM: The area's most famous attraction is accessed from Battery Park, just south of the Esplanade. Here, ferries to Liberty Island—home to the monumental Statue of Liberty—run to and fro every day except Christmas. This colossal testament to America's 19th- and 20th-century immigrant history is a point of pilgrimage for any first-time visitor to NYC—with the crowds to prove it. Prepare accordingly with our guide on How to Make the Most of Your Visit to Lady Liberty, and be sure to book timed ferry tickets well in advance from the sole ferry provider, Statue Cruises. The ferry also stops off at neighboring Ellis Island. The former federal immigration station, turned national museum of immigration, is well worthy of exploration, time permitting (see our How to Make the Most of Your Visit to Ellis Island guide for more details). If you've already visited Lady Liberty and Ellis Island on a prior occasion, consider other means of cruising out into New York Harbor from Lower Manhattan—the free Staten Island Ferry (4 South St.), the Shearwater classic schooner (from Brookfield Place's North Cove Marina), or sailing lessons via the Offshore Sailing School (also out of North Cove Marina) propose some good local alternatives. 2:30 PM: Refuel with a late lunch at the 2015-debuted Pier A Harbor House (22 Battery Pl. ), set on a historic Hudson River pier in a landmarked building dating to 1886—with its maritime theme and great views out onto the harbor, it's the perfect spot to grab some grub (don't miss the fresh oysters or craft beer). 3:45 PM: If you've got kids in tow (or even if you don't), it's well worth crossing over to the eastern side of Battery Park to check out the 2015-debuted, SeaGlass Carousel with its 30 fiberglass fish and color-changing LED lights, it's surely unlike any merry-go-round you've ever seen. 4 PM: North of Battery Park, it's well worth spending a couple of hours poking around at the many significant landmarks that sit at the core of NYC's Financial District, near world-famous Wall Street. For starters, don't miss a photo op with the fierce 7,000-pound bronze Charging Bull sculpture (by Italian sculptor Arturo Di Modica) in tiny Bowling Green Park (the city's first public park), which has become emblematic of the stock market. Continuing north on Broadway, stop at the historic Trinity Church (75 Broadway); dating to 1697, Alexander Hamilton is buried in the graveyard. Wander along Wall Street, home to the New York Stock Exchange (11 Wall St.), where billions of dollars in stock trading unfolds behind its six massive Corinthian columns. While the NYSE isn't open to visitors, visitors can pop into the Greek Revival-style Federal Hall National Monument across the street (26 Wall St.), where George Washington was sworn in as the first U.S. president in 1789 (it's now a museum dedicated to Washington and early American history). Nearby, tours can be booked for the Federal Reserve Bank (33 Liberty St.), reputedly the largest depository of gold in the world. 6 PM: Continue east to the East River-facing South Street Seaport historic district – once the main trading hub and harbor for Manhattan, where old 19th-century commercial buildings and cobblestoned streets have been reimagined as a 21st-century center for shopping, dining, drinking, and entertainment (including sightseeing cruises, historic ships, the South Street Seaport Museum, and a TKTS center for discounted Broadway show tickets). Bordered by the East River, Pearl Street, Dover Street, and John Street, visitors can stroll through the shopping mall on Pier 17 or grab a light bite or drink at some 40 eateries and bars (including options from the popular Brooklyn-imported Smorgasburg food market). 7:30 PM: Round out the evening wining-and-dining your way through pedestrianized Stone Street, an atmospheric cobblestoned stretch of small eateries and bars set along one the city's first paved streets (hence its name). Nearby, two noteworthy establishments should not be missed: Fraunces Tavern and Museum (54 Pearl St.), a watering hole and eatery dating back to George Washington's times (indeed, he did socialize here) and still a wonderful place to grab a bite and a drink; and The Dead Rabbit Grocery and Grog (30 Water St.), lauded for its superlative cocktails sourced from seasonal ingredients and vintage recipes. 9:30 AM: It's worth a wander a bit north of the hotel to Zucker's Bagels (146 Chambers St.) for hand-rolled, kettle-boiled, NYC-style bagels, served with specialty coffees. 10 AM: Mosey over to the pretty and historic City Hall Park (site of City Hall) and its environs where you can take in a few more notable historic landmarks. Don't miss St. Paul's Chapel (209 Broadway), dating to 1766, where George Washington worshiped after his inauguration; it somewhat miraculously survived the 9/11 attacks, despite its close proximity to Ground Zero. Nearby, take a gander at the 60-story, neo-Gothic Woolworth Building (233 Broadway)—aka the "cathedral of commerce," which was the tallest building in the world when it debuted in 1913. 11 AM: Across from City Hall Park is the pedestrian access point for the Brooklyn Bridge, which marks one of NYC's most iconic strolls. The architecturally stunning, neo-Gothic Brooklyn Bridge, dating to 1883, is considered still today to be one of the world's loveliest bridges, and the views from its pedestrian walkway, which connect the NYC boroughs of Manhattan and Brooklyn, certainly don't disappoint. Make the most of your mile-long walk across the beloved bridge with these 9 smart tips, and keep in mind that you should give yourself about an hour to cross over one way, especially if you plan to stop and enjoy the views and take photos. Remember to give yourself plenty of time to backtrack; you can also take the subway back from the Brooklyn side for the return trek.